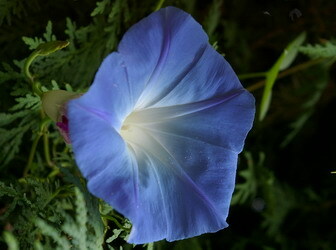 explain the enduring popularity of Heavenly Blue, Morning Glories. My summer garden is never without them and I have even devised a trellis to grow a free standing column of these delicate flowers. A little research will also tell you that as far back as the Aztecs, the seeds of Morning Glory Ipomoea tricolor were known for their mild hallucinogenic properties. I can provide absolutely no personal affirmation of this. I just love to get up each morning and be greeted by a fresh batch of these paper thin, true blue flowers. In fact I frequently put a trellis of them where they can be seen from the bedroom window . My Morning Glory trellis is in excess of 8' / 240 cm and by late August they are at the top, winding around and looking for new places to go. One year they found my neighbours tree and proceeded at least another 8' up it. Not suitable for a pot and tiny trellis on your balcony. My trellis is mostly string and I use a compostable jute string so that I just remove the mass of vines and string in the fall and throw the whole mess into the compost box. The trellis you see in this picture (with a red flowered variety,) is an inverted pyramid and is only about 12" /30 cm its base. It has a very small footprint in the garden but it is about 4' / 120 cm square at the top so you must put it where it won’t interfere with anything else tall. Mine are usually beside a path so that you can walk under them. No! Actually they are quite easy to grow. They are annuals that need to be started from seed each year. They will actually put on a reasonable show by midsummer if the seed is directly planted in the ground, around the base of whatever you are going to use to support them. Mine start indoors about 4 - 5 weeks before the frost free date, that I can safely put them outside. If you start them too early then they start to twine and climb and as they use each other for support, separating them at planting time becomes a very frustrating job. It’s very simple and I have reused mine for several years with only minor repairs. The centre is an 8' / 240 cm - 4 X4. It is held upright by using one of the metal post holders that you simply drive into the ground. At it’s base is a 12" /30 cm frame and at the top a similar frame about 4' / 120 cm square. There is a middle frame that keeps the strings in a straight line from the bottom to the top. The outside edges of these frames have some brass screws inserted about half way in. Spend the extra money for the brass screws they will still be there and be useable several years down the road. The frames are made of cedar for the same reason. The 4x4 can be pressure treated wood. Simply string the jute twine up and down the trellis using the screws and you are ready to go. Unless you are a 7' basketball star, it’s much easier to put the string on first and then stand the finished trellis in its metal holder. Plant the Morning Glories. Water and wait. 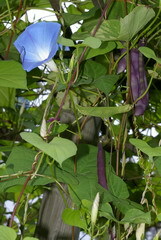 Of course I’ve been known to mix Pole Beans with the Morning Glories. See the purple beans in the picture. Oh! It also makes the neighbours sit up and take notice.